What do you get when you combine the skills of a hard-nosed Business Editor with those of an experienced art teacher? Creative Coverage! Founders, husband and wife team, Tim and Caroline Saunders share a passion for arts and crafts. They realise that professional artists and craftspeople do not want to waste their valuable time promoting themselves when, let’s face it, they would much rather be producing work. That’s why there's a need for Creative Coverage. 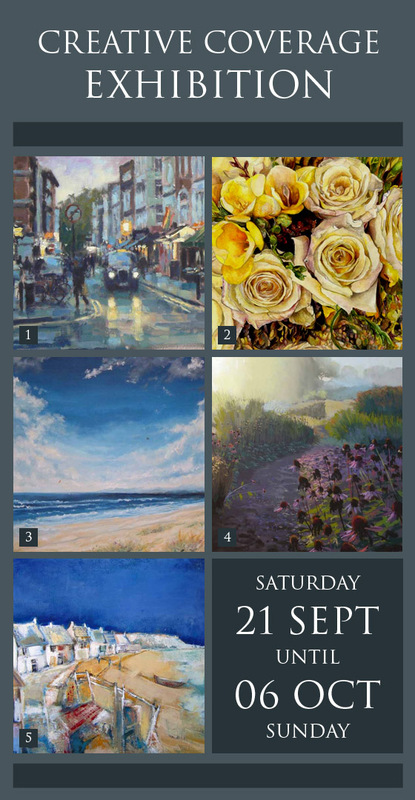 [mine] creative space and art gallery is delighted to be hosting this new show with five artists represented by Creative Coverage from Saturday 21 September until Sunday 6 October. 1) DAVID FARREN was born in Wiltshire in 1972 and now lives in Lytham St Annes, Lancashire where he works in his garden studio. "After leaving university in 1993 I travelled around France and Spain and began to paint regularly," he says. "While living in Madrid I had my first exhibition and realised that this was what I wanted to do. David has gained a reputation as a modern impressionist, using open brushwork and colour to represent the energy and movement of the landscape. A pivotal moment in David's career was his first trip to New York in 2001 where he was inspired to paint cityscapes. "I like to concentrate on the everyday scenes of street life and am fascinated by the changing light within a scene and how it determines the mood of a place at a particular time - be it a busy New York street or a quiet corner of the Lake District." David exhibits his work in leading galleries across the UK and his paintings can be found in collections in the UK, France, USA and Bermuda, including the private collection of British actress Felicity Kendal. 2) SUSIE LIDSTONE is well-known for her botanical watercolours. A member of The Society of Floral Painters, she has a Fine Art Printmaking degree. Her own range of greetings cards and limited edition prints are widely available. She is regularly commissioned to produce paintings of properties. Susie’s projects for children have been very successful and are available in kit form at an online children’s store. Since her childhood she has admired the artist Elizabeth Blackadder and has had the pleasure of exhibiting alongside her. Susie is an elected member of The Society of Architectural Illustrators. 3) ROY MACINTOSH sold his first oil painting in 1973, at the age of 14; since then some 700 original works have entered private collections throughout Europe, the USA and the Antipodes. Illness in 2007 disabled Roy’s natural right-handedness after three strokes in five days, resulting in open heart surgery to replace the mitral valve. He learned to write with his left hand, but recovery has been slow. Roy only started to paint again in August 2011 having spent the previous two years retraining his right hand. In July 2012, Roy exhibited 52 works near his home in Surrey, with great success. He is now painting landscapes of north east Scotland, Dorset, Cheshire, Cambridge, Devon and Cornwall. 4) ROBIN PICKERING'S interest in painting began as a collector of fine art and this background is the inspiration behind his development as an artist. Although he paints in both pastels and oils, it is for his pastels that he is best known, a medium he exploits with individuality, achieving vibrant and intense effects. As places affect him in different ways, so Robin’s artistic response tends to vary, from the loose semi-abstractions of his Venetian and recent landscape work to the more sharply-defined approach of his seascapes. His work is never therefore formulaic, but always springs from a preoccupation with colour and light. His paintings have been been selected for exhibition by the Royal West of England Academy, the South West Academy of Arts, the Pastel Society and Exeter University. Work has also been reproduced as fine art prints by Solomon & Whitehead and Buckingham Fine Art. 5) EILEEN SEY was born in the wild storm tossed north east coast of Scotland. She graduated at Gray's School of Art in Aberdeen and after a long career of teaching art, she moved to the south coast of Hampshire to concentrate on painting. Her subjects are generally inspired by local and Cornish landscapes, harbours and coastlines. Eileen's work ranges from almost representational to abstract, in acrylic, oils and mixed media on canvas, board and paper. She strives to evoke the effects of varying weather conditions on the landscape and the margins of the sea. Eileen tends to paint spontaneously and quickly without attempting to recreate reality and although the work tends to be figurative, in many ways an abstract element is present. Eileen has carried out commissions of large abstract paintings for interiors in Sandbanks and Brighton. Her work has also been exhibited at the Royal West of England Academy, Southampton Art Gallery and the Affordable Art Fair. Examples of her work were purchased by Hampshire County Council and also featured in the prestigious "National Collection of Works in Public Ownership" volume.